Blog - Romantic Birthday Gifts for Her- 8 Ideas She'll Love! Romantic Birthday Gifts for Her- 8 Ideas She'll Love! Are you looking for romantic birthday gifts for her? If so, you need to check out this article. If your wife or girlfriend's birthday is right around the corner, you might find yourself at a loss for what to get her. You want your gift to say something to her. Romantic gifts don't have to be reserved for just valentine's day or anniversaries. Romantic birthday gifts for her are the best way to say that you love and appreciate her. But what romantic gift would she like? We all know diamonds, roses, and chocolate are a way to a woman's heart, but how can you take it to the next level? Keep reading to uncover 8 romantic birthday gifts for her that she will love. Chocolates are a great (and delicious) way to wish her a happy birthday while keeping the romance alive. But don't settle for any old chocolates. There are tons of ways you can customise your chocolate gift to make it extra special for her. You can have a romantic birthday message or a cute picture of the two of you printed on the box. You could also include a handwritten letter inside the box for her to find. Another way to customise your chocolate gift is to give her a unique kind of chocolate. Red wine-infused truffles are a great way to combine two of her favourite things. If you consider yourselves wine-connoisseurs in the making, then this is a great gift for both of you! There are various types of wine subscriptions available that will send you 1 to 4 bottles of wine to try every month! It's a great way to expand your pallet and try new types of wine. It also doubles as the perfect excuse to have weekly at-home "wine and dine" dates. Every woman likes unwrapping something on her birthday. So, a customised pair of wine glasses would be the perfect add-on to her new wine subscription. You could get your initials or wedding date engraved into a pair of wine glasses for a sentimental and functional gift. If your wife is the sentimental type, she'd love a framed copy of your wedding vows written in beautiful calligraphy. Send your vows to a professional calligrapher and have them copy your vows in beautiful writing to match the beauty of your wedding day. Then, find the perfect frame to preserve this art. With the right font and thick-stock paper, this can also be mimicked right on your own computer. That's right, you don't have to spend a lot to create romantic birthday gifts for her. If you're not married yet, another wall art option would be to utilise your own voice. By simply recording your voice saying something meaningful, you can create one of the most timeless and romantic birthday gifts for her. There are several online shops that will print your voice waves onto canvas or jewellery. She'll love the thoughtful nature of this gift, and it will serve as a romantic keepsake that will hang on your wall for years. If she works hard, then give her a bath basket to help her relax. You can include bubble bath, bath salts, a bath bomb, lotion, and scented candles, all in her favourite scent. Of course, you don't have to create this basket yourself. There are numerous stores and online shops that sell the perfect relaxing bath baskets. Consider upgrading to a kit with essential oils to promote relaxation. Nothing says romance like a bubble bath and scented candles. Every woman loves roses, right? Next to chocolates, roses are the most classic romantic gift for women. She'd love a beautiful bouquet for her birthday, but in a few weeks (or days), when the flowers die, she'll have nothing to remember your romantic birthday gift by. 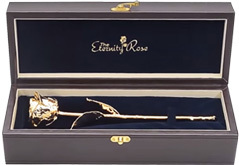 Instead, upgrade to an Eternity Rose which is a preserved rose. 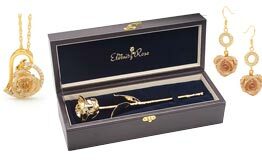 These are real roses that last forever by being dipped in gold, silver, or platinum, or glazed in their natural and glorious colour with gold trimming. If she doesn’t have a particular colour or favourite style of jewellery, then for a romantic occasion, we suggest the classic red rose trimmed with gold. For bold and sophisticated women, we'd go with the gold-dipped or platinum-dipped rose. Stylish and comfortable pyjamas are hard to come by - it's usually one or the other. Surprise her with a silk pyjama set so she can feel beautiful and sleep well at night. Silk pyjamas are light and comfortable, but also help women feel confident. We recommend a silk romper or shorts set for added comfort. Everyone knows that diamonds are a woman's best friend. But how can you give her jewellery that's special and unique to her? Well, first think of the kind of jewellery she already wears. Does she like gold or silver? Does she prefer statement or subtle jewellery? Once you've pinpointed her style, it's time to make it special for her. 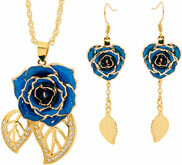 If she likes flowers and classic jewellery, consider a beautiful glazed rose necklace. The rose is made from genuine glazed mini rose petals and is fashioned into a gorgeous gold-trimmed pendant encrusted with synthetic diamonds. It's a gift any woman would love. Other options include an engraved bracelet or locket (making sure to include your favourite picture of you two, of course). If fancy jewellery isn't her style, consider getting a watch. 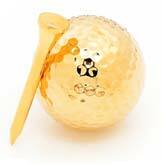 They come in all shapes and styles, and they can still be engraved to add that extra special, romantic effect. If you want to wow your girlfriend or wife this year, do it with a special, romantic birthday gift. Don't be fooled into thinking that romantic gifts are reserved for Valentine's day - women love romantic gifts for every occasion. And there's a romantic gift perfect for every type of woman. Is she sentimental? Consider getting her a voice wave art. Does she enjoy classic romance with a twist? 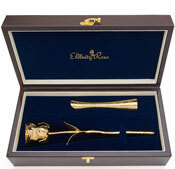 Give her preserved roses or customised jewellery special for her. Do you need some more romantic gift ideas? Check out our guide to choosing the best romantic valentines day gifts for her.